Evangelical Protestants who support President Trump are guilty of imposing “wickedness” on the nation, wrote Will Saletan for Slate on Sunday. The underlying problem, Saletan insists, is that in the case of Trump, evangelicals have allowed matters of policy and governance to overshadow the personal morality of the president. Whatever his effects on the economy, on the Supreme Court, religious liberty, or life issues, Saletan suggests, Christians have a moral obligation to reject the president for his personal moral flaws. When white evangelicals were asked to name the factors that influenced their votes in 2016, Saletan said, their top issues were “the economy, health care, national security, and immigration,” issues that Saletan deems unworthy of the concern of true Christians. In particular, Saletan claims, evangelicals’ enthusiasm for Trump’s immigration policy is generated by “fear of immigrants per se” and especially Muslim immigrants. 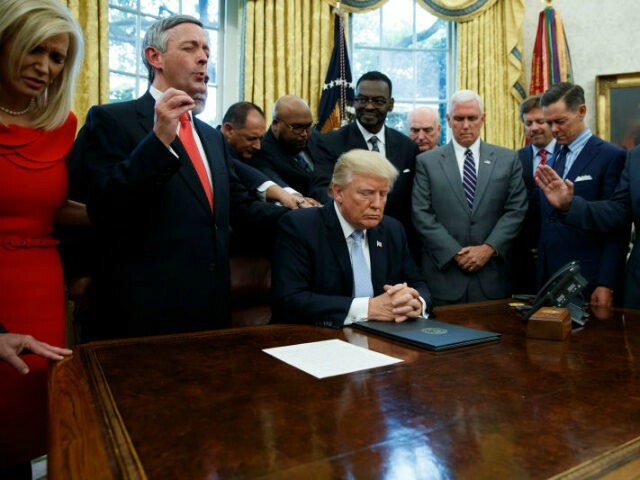 Trump “has advocated political violence and war crimes,” “attacks basic values,” and “works to corrupt the country,” Saletan writes, which means that Christians who support him support evil. Despite his personal Jewish background, Mr. Saletan does not shy away from donning a theologian’s cap and explaining to Christians what their political priorities should be. Therefore, “Jerry Falwell Jr., Robert Jeffress, Franklin Graham, and others who stand with Trump in these fights should no longer be taken seriously as spokesmen for a faith,” he states. “They’re purveyors of evil,” he declares.